Sometimes, we just can't seem to figure out whether we want a complete modern and contemporary home or a slightly country feel with that rustic kick. We want a little bit of both, but how do you clash two different style genres? You are about to see through the ideabook we've prepared for you today. 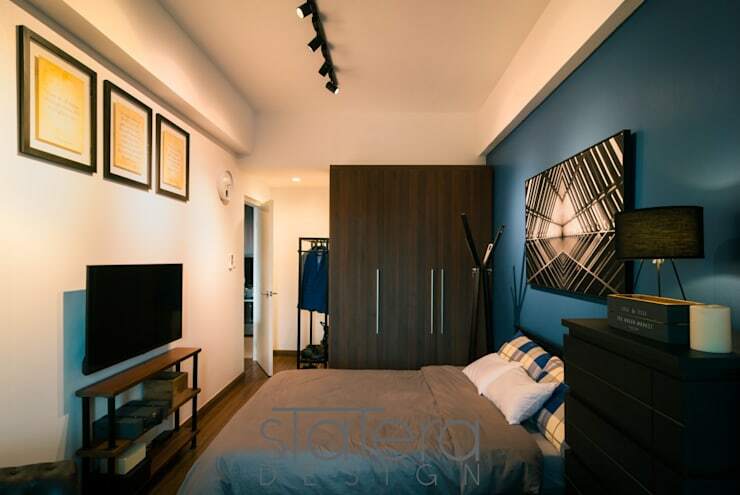 Nestled in the heart of Makati, this bold and cozy apartment loft by Statera Design (based in Quezon city) will surely drop your jaws. If you want to see a perfect combination of earthy and modish, keep on scrolling! Right when you enter the living room, you can definitely see the interiors oozing with different kinds of aesthetics. Look straight to the walls and you will appreciate the brick wall carrying out a country vibe to the room. Then look over to the sofa and rug and you will admire the contemporary textiles and colors. It's completely a perfect unison of styles! In addition to that, the wall decor also offers a blend of country and modern styles -- abstract paintings for modern, while vintage pieces for country. Stunning! Looking closer on the finer details, the dining area of this apartment is just lovely to dine at. 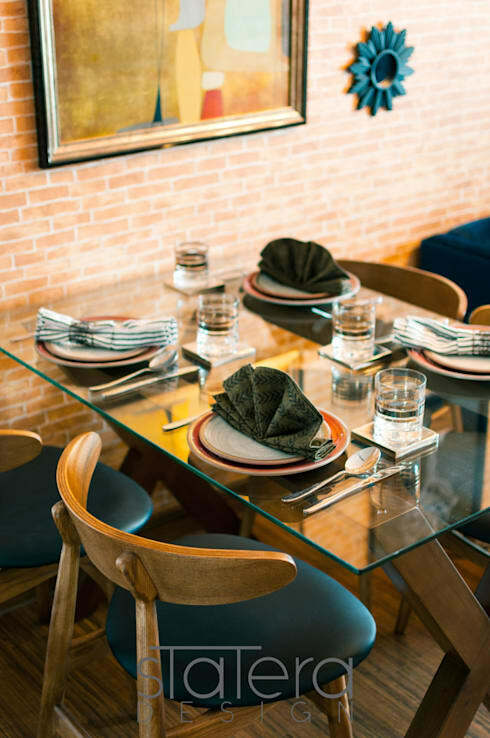 It features a sleek glass dining table on a Mahogany wooden legs, along with dining chairs also made of Mahogany and blue cushions. One thing's absolutely noticeable here, for sure -- the bricked wall. 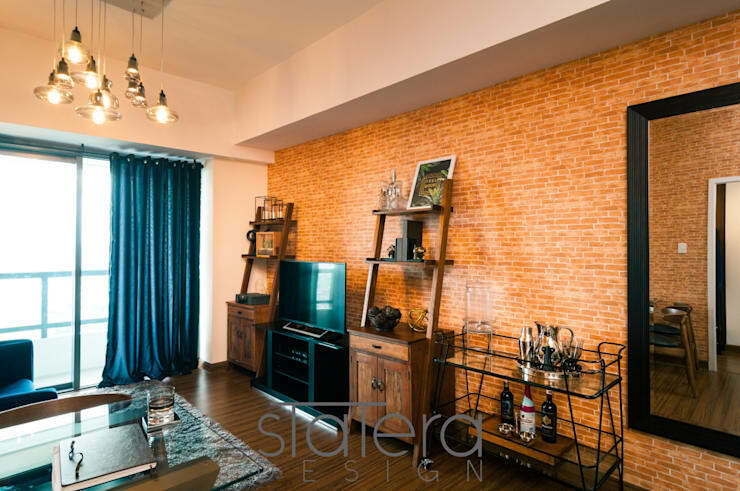 This apartment's living room showcases its bold yet warm bricked wall in burnt orange. It creates a lively vibe to the interiors that just ultimately brightens up the space. To better balance the rustic appeal of the home, furniture made of unpolished, dark wood are furnished against the wall. Chic decor and memorabilia flourish to keep the modern, rustic aura of the interiors going. Moving forward, check out this absolutely stylish bedroom. Now, more of the modern influences are seen all throughout the room. In this angle, a lot of bold blues enhance the bedroom's modern appeal. Blue can either be calm color or a daring one, and in this room, it's definitely the latter. It's a complete contrast from the apartment's living room being warm and cozy, as this represents a strong set of interior elements. In this angle, this strong bedroom not only oozes with blue tones, but also with a lot of grey and black hues. The sleek dark grey finish of the cabinet, comfy grey bed linens, black side cabinet as well as the black and white wall decor all create a solid modern look to the bedroom. 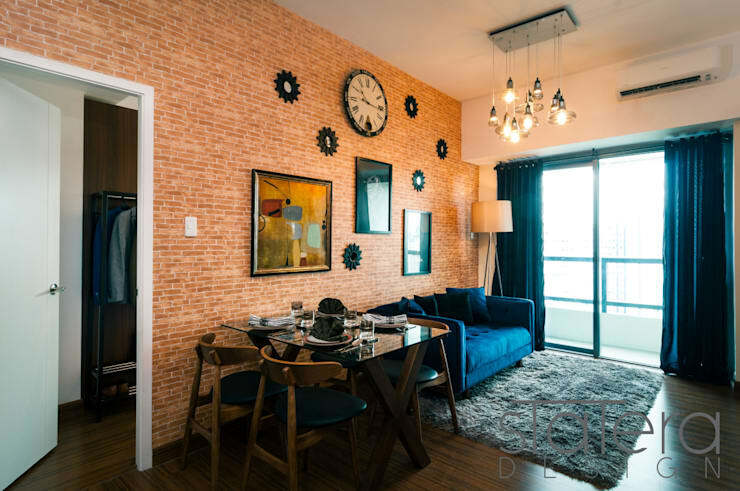 Need more inspiration for apartments in the Manila area? 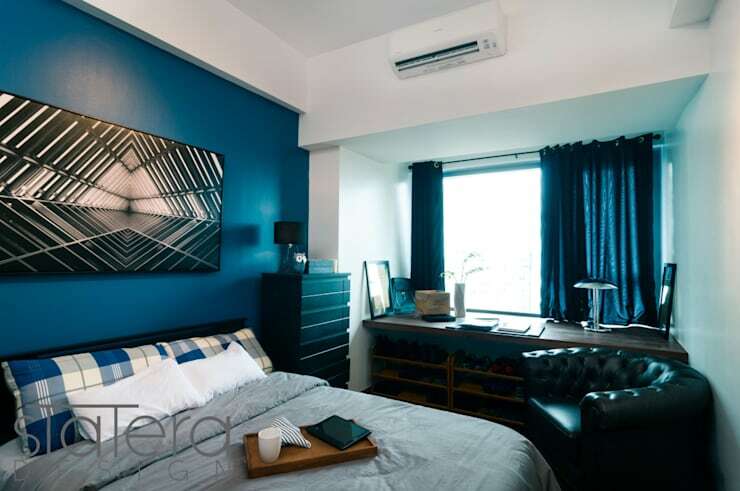 Check out this article—’This small modern apartment in Manila is perfect for a young couple’.